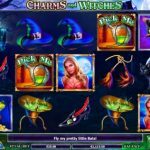 Charms and Witches is a video slot game from Nextgen Gaming that has a spooky theme, one that would be appropriate for Halloween. But that does not mean that you should play this slot only then, since it is available all year round. The design of the game is perfect with all those gloomy colors, and beautifully crafted symbols. Witness the girl’s transformation into a witch or the frog that turns into man. Charms and Witches is packed with special features. First we have the Pick Me Bonus. You need to land 3 or more beaker scatter symbols on the second, third and the fourth reel and pick one symbol to reveal your prize. The main feature is the free spins round. This feature is activated with 3 or more bat scatter symbols for which you will receive 10 free spins with all wins doubled. It is also possible to retrigger the feature which is a nice addition. 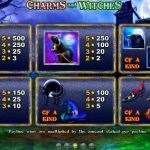 The Spooky Bats Bonus occurs randomly both during the base game and the free spins. This is when a swarm of bats fly across the screen turning symbols wild. Charms and Witches is definitely one of those games that you need to try. This title is coming from Nextgen Gaming and they have done a tremendous job creating this game. The design of the slot is quite attractive and the sound effects will lead you into the mood immediately. We just hope that you are not easily spooked, but if you are it is even better, because you will feel an adrenaline rush. 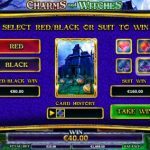 The betting options are wide in Charms and Witches, so you will find the bet size that suits your bank roll no matter if you are a high roller or low roller. For a very rewarding and engaging slot game consider playing Casinomeister a 5 reel slot by NextGen.